-- WARNING! -- All notices and guides are only for experienced technicians, if you are in doubt, please do not do something that can damage your Kawai K5, read the notes on the bottom of this site. Some of the informations(e.g. phone numbers) may be outdated, because this is a place where K5 users talk about their solutions and a mirror of vanished content. I recently replaced my backlight and inverter on my K5 and thought I would pass on some technical info on the Kfuenf page. 1) I replaced my backlight with one I ordered from www.nightlaunch.com. ($8.95 plus S/H). It took less than two weeks from when I ordered to get the parts and the parts look good. Good news/bad news though on my backlight. The good news: I had no problems removing the LCD, taking out the old backlight and sliding in the new backlight. The new light has some wires and a plastic "tab" that kind of gets in the way, so I soldered the backlight wires to where the wires connect to the LCD board. Hint:You have to cut the new backlight to size, so make the backlight a little longer (say 1/4 inch) than the original to make things easier. Bad news: My backlight does not work but I think my inverter is the problem. I am only getting about 1/2 Volt at the output of my inverter, and I am supposed to get 120V @400Hz if I understand the part correctly. I tested my inverter before I did the backlight install and saw it had low voltage, but I was hoping that my existing "dead" backlight was causing the problem (i.e. it was shorted.) I guess not because even with the new backlight I get very low voltage. Digikey part # 289-1032-ND and it only cost $11.90 - not bad. Note that the inverter does not fit exactly (see below)and requires some additional wiring. Anyway, I had my K5 open to look at the power supply to plan the new inverter install when my K5 started "humming", and guess what, I now have a beautiful blue backlight. It looks great, a very cool blue. So it appears my inverter was not bad, but it just has bad solder joints. It is working for now but tomorrow I will likely take out the board and redo all the solder joints. Just some additional info I learned in researching backlights and inverters. The "brightness" of the backlight is a function of the voltage and frequency applied to the backlight. It appears one has a lot of flexibility in selecting the inverter output voltage and freq. The higher the voltage and freq the brighter the backlight. However, the backlight will "burn out" quicker the higher the freq. So there is a trade off, high freq = bright but shorter life. Right now my stock inverter is putting out about 102V @ 380 Hz. I think the inverter I ordered will put out about 95V @ 540 Hz and should work with a 3 - 6 V DC input. I understand the K5 feeds the inverter with 5V DC so the part should work great. 3) Today I got my parts for DigiKey. Recall I replaced my backlight with a blue backlight from nightlaunch.com. It worked with my stock K5 inverter. However, my stock inverter was very flaky, even after I did the resolder job so I decided to replace the stock inverter with the DigiKey part. (Digikey part 289-1032-ND). The good news is that inverter works (even though it is only about 95V @ about 550Hz). It is a slightly different color blue than before (a bit more white now), but it still looks great. Also- THERE IS VIRTUALLY NO HUM! The only warning is the Digikey part is not the exact same size as the original inverter - it is a bit smaller in footprint and a lot shorter. The stock inverter has only three connections (in - out - ground) and the new inverter has a fourth pin for mounting. because the part is smaller, I used the original hole for the "out", but I had to wire up jumpers to the "ground" and the "in" - not a big deal but it is some extra work - and you don't want to see pictures of my ugly job. :). But so far so good. -After you removed the small metal disc, clean inside of the button. the last 1/8 of the volume and something might blow in the K5 if so. -Not as the guy tells, 1/4w resistors fit perfectly, you just have to put them in vertical position..
-The K5 crashes when you get in multi mode. -If PGM is set to MULTI in the MIDI config, you can't access to single sounds. 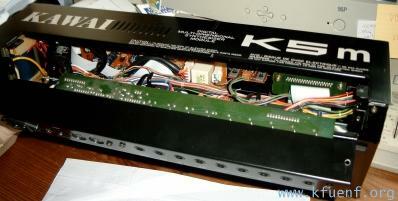 to singles, your K5 got bugs. are that's it's a CR14250 and it's 3v. -Non-working backlight(If the K5 stopped to make it's typical inverter hum). -LOUD hum is heard when headphones are plugged in the headphones plug. cracked, since they might crack in a couple of time. 0.5.Read everything before starting to do it or your K5 could be unusable after. (IC8 and 9's are facing some MB84053B ICs). 3.Start cutting all the 14 pins of one of the 064D. (Note 1:Cut them in the 90deg. a soldering iron and do the same for each pins. 5.After you finished to do this, add solder to every hole that isn't flat with the PCB. when the solder's melted, press the pump's button. 7.Place a 14pin IC socket where a 064D was and solder it. 8.Put a TL074 in the socket the same way the 064D was on the PCB. And after you did this for all the 4 of thems, replug everything. can be moved so that the cables do not point down. degrees, and mount the screws. instructions at your own risk. version. The ROMs available are 1.0, 1.1 and 1.2.
schematics, you have to sign a non-disclosure agreement. ROM upgrades are FREE! You just have to send them your old ROM when you are done! ground yourself. The case is hinged, there are 4 screws that hold the top portion closed. Remove the four screws and hopefully your front panel will just open like a book. Unfortunately, The rightmost upper PC board was not mounted correctly on my unit. remove the sticker! I believe this may be one of the old style light sensitive EPROMS. Close up your case reversing the method of opening it, and boot your machine. bugs in the midi sysex implementation are also fixed! action of this keyboard. It is definitely a step up from the Mirage! From left to right, remove the ground that is screwed to the far left of the keyboard. Unplug the connection for the modulation wheel and pitch shifter from the PC board. holding it on. Now you should be able to look into the mechanism of your High C key. here. Now you should see a black contact pad... THIS is the root of your problem!! grey stuff? Well, if you used the wrong solvent, that is surface of your contact! back over while supporting the keyboard. Reattach the eight screws. Plug it in. again, it always surprises me when I play it!!! do remember my fingers were real sore afterwards. know exactly what is involved. Original content by a someone named Martin at ucr.edu . section is on a board labelled 'MI004'. Look for U6, U7, etc. As a side note, always use the individual outs and Multi mode. Multi mode is quieter than Single. for resonance-type effects because it was just way too noisy. the feedback resistors in the output op amps from 56k to 147k. Plenty of volume, even with 0 flat level and a sharp cutoff. You have to watch your volume levels, though, to avoid distortion. tough time getting typical 1/4W resistors in there. resistor leads through the board. unscrew the rack ears and the rotating output assembly. (3) Locate the PCB labelled "MI-004". K5:  it's on the left side above the keyboard. them to get at a few of the resistors in question. the conductivity of Elmer's glue when it dries? be sure to reattach them. desoldering braid, but had to heat and pull a couple of them. side while you heat the trace side. multi mode is quieter than single mode. YOU ARE USING THE GUIDES ON YOUR OWN RISK! WHILE USING OR MISUSING THIS GUIDE. NO WARRANTY OF ANY KIND IS EXPRESSED OR IMPLIED EVEN IF YOU USE THE GUIDE CORRECTLY. All links on this guide site are not for advertising, they are only linked here for helping K5 owners.